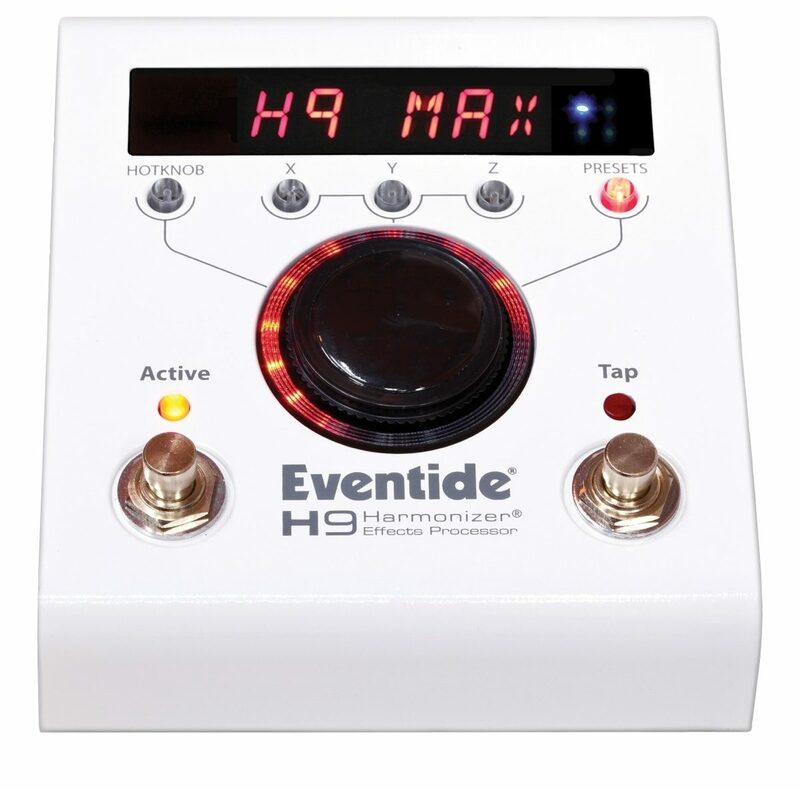 The Eventide H9 Max includes all 45 algorithms and associated presets from Space, TimeFactor, PitchFactor, and Modfactor. Plus, UltraTap delay, Resonator, and compressor EQ. Ships with 99 factory presets inside (all others available via H9 Control App). - Manual, documentation, and power supply included. - The H9 Control app works on Windows, OSX, Android, and iOS devices. zZounds is an authorized dealer of Eventide products. Eventide Warranty ﻿Eventide's warranty is one year parts and labor. 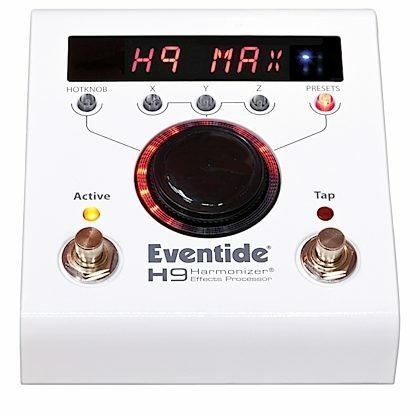 When you thought that Eventide couldn't add more to an already incredible pedal, in comes the H9 Max. With more effects than you can think of -- including all 45 algorithms and 99 presets from the Space, TimeFactor, PitchFactor and ModFactor -- this multieffects box can help you get just about anything you're looking for. Using the original H9 Harmonizer pedal as a base, the "Max" version provides even more choices. Instead of getting one of Eventide's lesser H9 pedals and buying additional algorithms, you can pick up this maxed-out pedal that's pre-loaded with them all. Already have an H9 Harmonizer pedal? You can link the H9 Max to your existing H9, and copy any of the H9 Max's 45 algorithms to your other pedal. For gigs when you need the portability of a single pedal, but the sound of many pedals, this will be the one to go for. "Excellent product and excellent implementation"
Overall: I play ambient, experimental, and also conventional music, and the H9 fits the bill perfectly for me. I split my guitar signal after a compressor between an amp sim (atomic Amplifire) and an SY-300 synthesizer, and the H9 now goes after the amp sim and is the ideal stereo audio companion to the SY-300 sound in my live stereo setup mix. I hooked in my expression pedal and it is very useful by default. But what really makes it convenient is the phone/tablet app. Excellent software and very easy to use. I set my phone in a holder on a mic stand and choose presets or adjust the device remotely with a touch through the bluetooth connection. No need to touch the pedal at all! Adjusting everything is easy with the app. I was clearly guided through the software installation and hardware updating procedure by the install process as well. Value is a notch off only because it is rather expensive. The one possible drawback is the fact it's one effect at a time, despite the wide raging choice of effects. For me this is no problem. The Amplifire and SY-300 both have good effects and I have a Obscura delay in my chain if I need to layer effects. I needed something to set off my conventional guitar signal chain, and this is PERFECT for me. And kudos to zZounds for getting this to me much faster than I thought it would take over a major holiday. I'm impressed. Style of Music: All good music of all genres and styles from around the world and throughout all time. Overall: So many quality sounds, excellent support, a well-built, well-designed product. I had to think twice about spending this kind of money on a pedal but now that I have it, I'm glad I bought it.I really don't need any other pedals for the life of this one though I will probably buy a 'Core'as well so I can play two effects at once. There is a lot to learn and love about this box and it will take time to get to know it, especially if you're using it for gigs like I am. I feel there is nothing I could ever need that this pedal can't give me. If you're a great guitar player and need something to accent your style, you will not regret buying the H9 Max.